Don’t worry, he’ll thank you later! 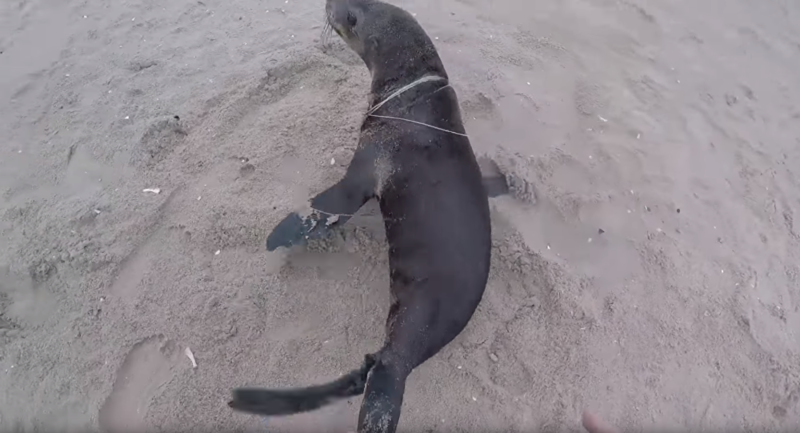 One seal on the coast of Walvis Bay, Namibia, is now on the road to recovery after Naude Dreyer, a local kayaking business owner, decided to free the fearful pup from a fishing line last month. After spotting the struggling animal on the beach, Dreyer is seen stabilizing the creature between his legs after catching the seal by its rear flippers. He then manages to hold the flailing creature long enough to cut the fishing line, which he says is the "usual suspect" around Walvis Bay. "Last year my team and I rescued over 300 animals caught up in rubbish. This particular one was a bit bigger than the usual rescue cases, so I had to be extra careful. She nearly managed to get a bite out of me on my first attempt!" Dreyer, who also assists with the Namibian Dolphin Project, told Storyful. The rescuer added that he believes the seal will hopefully "heal up quite quickly in the salt water."